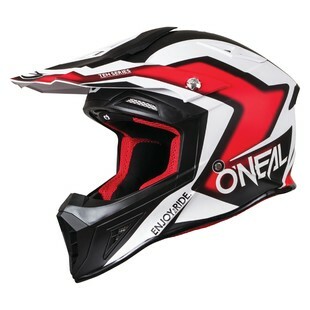 At the price point of $299.99, the 10 Series is O'Neal's top shelf helmet. The first thing I noticed about the helmet is how lightweight it is. It's seriously so light, it makes you second guess it's construction. But, you can be sure that this helmet has got high ratings and will protect your dome in the event you decide to take a dirt nap. It meets standards for DOT, ECE 22-05, AS/NZS and ACU. So, you're good! The helmet fits pretty well (I wear a Large). I would say it runs just a tad bigger than my Fox V-2, but it still fits well. The padding inside the helmet is removable, moisture wicking, very comfortable and the helmet provides plenty of air flow. I did notice that the base of the helmet feels like it sits a tad higher on my head than my Fox helmet. I wear an Atlas neck brace so there is a bit more room between the base of the helmet and my brace, but it still works in conjunction with my brace. So, not a problem, just a different fit. What can I say, this helmet has all the features you would expect from a piece of gear at this price point.